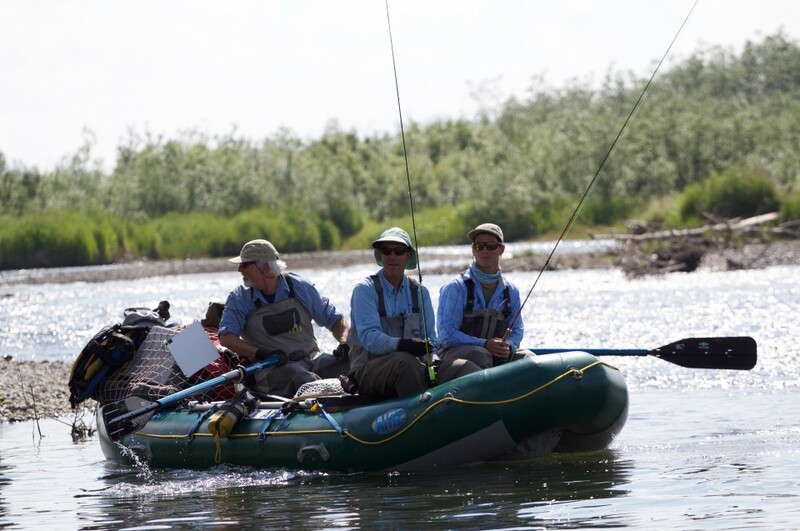 A team of Veterans undertakes the first fly-fishing expedition on the Kanektok River of 2015; adapting techniques of “LRRP”, Long Range Reconnaissance and Patrol. 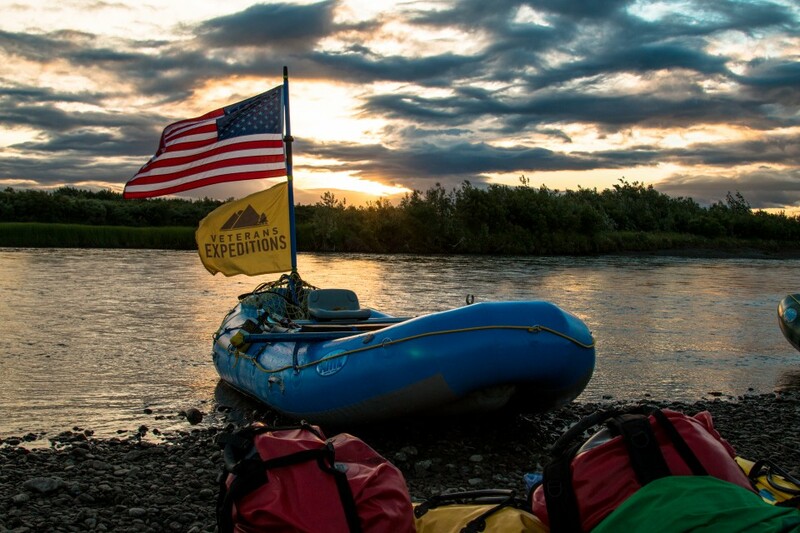 We planned to travel lighter than standard guided trips to enable us to efficiently explore farther from the established channels and pioneer some new camps off the main river channel. To do this we’d forgo traditional tents in favor of Black Diamond Megamids and Bivy sacks under a group tarp shelter. We’d drastically reduce the amount of food we’d carry and cut weight by configuring ½ our rafts as paddle rafts, saving almost 100# in oar frames and oars. We asked participants to shave weight in their personal gear so that rafts would be as light as possible. 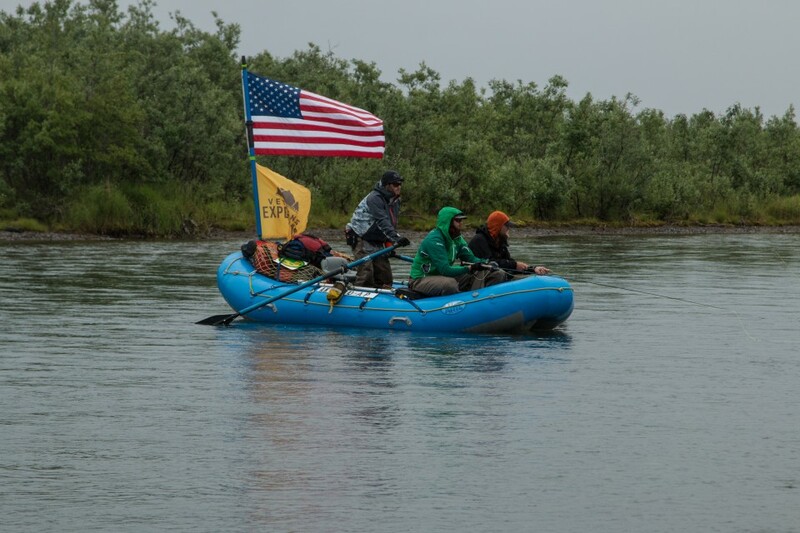 This was the third annual Veterans Expeditions Alaska Fly Fishing Trip and the second year of experimenting with the “LRRP” (Long Range Reconnaissance and Patrol” concept. 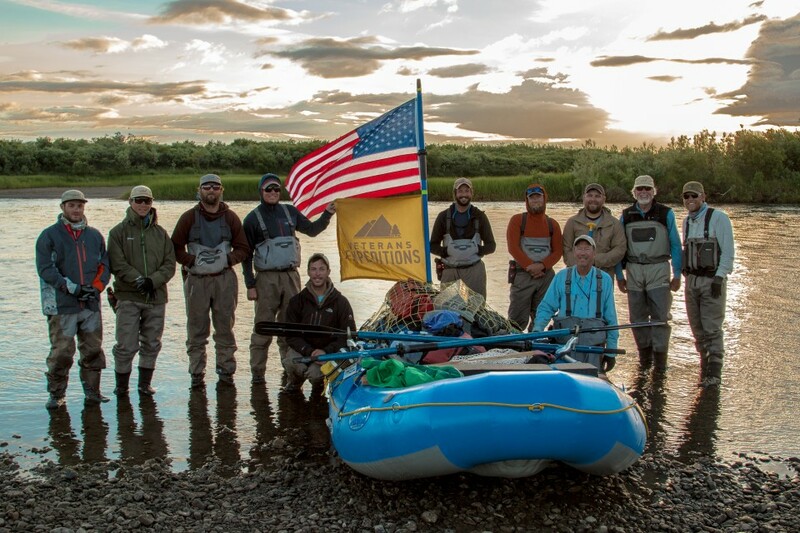 The annual Alaska trip is a brainchild of Nick Watson co-founder and Director of “Veterans Expeditions.” Nick strives to involve military veterans in expeditionary travel, and fly-fishing in a more profound way than being passive recipients of a “fully guided fly fishing trip”. 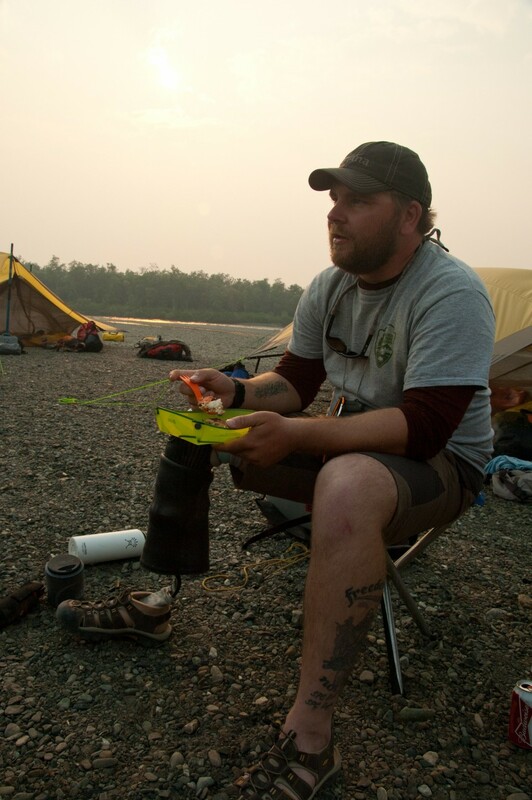 Nick wants veterans to experience authentic and visceral, even edgy expeditionary travel rather than something “canned” with passive participation. We’d see if we were up to his standards. The LRRP concept applied to expeditionary fly fishing is to travel light without excess gear, to explore lesser known waters off the beaten track- to use scouts to reconnoiter where potentially hazardous conditions might put participants at risk – to explore vantage points gained from uplands away from the river, to rely on each other as a team to solve problems, and with a little luck catch the first wild Kanektok fish of the season on the fly! traumas. One participant took his cap off revealing a six-inch scar from a battlefield injury to the skull. Another walked into our initial briefing with a prosthetic leg from an I.E.D explosion. Purple hearts from wounds in Viet Nam told another story. Halting speech from a team member with a brilliant mind evidenced another’s traumatic brain injury. Fly out day started at 0600 hrs getting packed, breakfasted, time at the floatplane lake to weigh all the gear, and load it into aircraft. We flew outbound through mountain passes in floatplanes. We passed the Gechiak Lake fire, a 14,000 acre lightning fire under the left wing in the Togiak River drainage then angled north past Kemuk Lake, and turned west before descending into Pegati Lake, the headwaters of the Kanektok. The air logistics to move our party of 12, consumed much of the day. 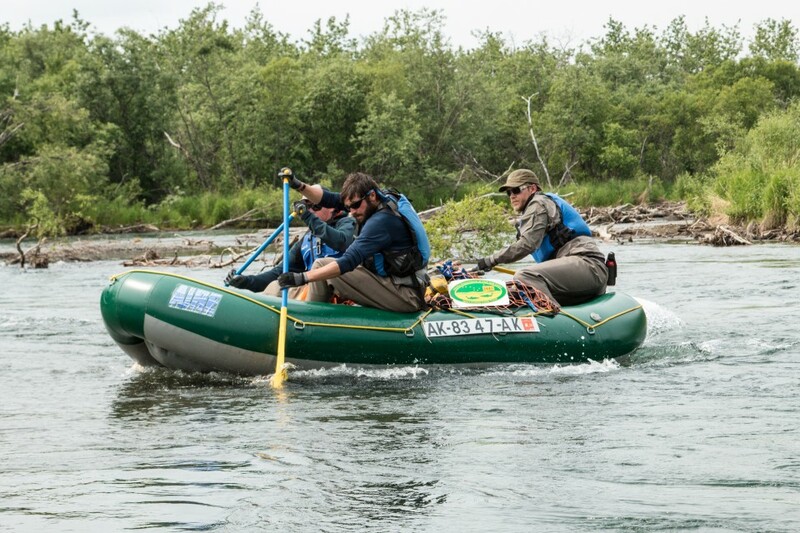 2 paddle rafts that could go light and fast and 2 oar boats to carry bulkier gear were assembled by a team with above average mechanical skills. Then we shoved off downriver. With the LRRP group we’d travel late into the first evening and use the midnight sun to “crack off” some miles, fully aware we could have an easier time of it camping at the lake. The team pushed ahead late as the midnight sun extinguished itself to the north and passed a cow moose with a calf. Participants alternately dragged rafts through the shallows then paddled through alpine pools. Paddlers worked on their strokes. A leopard spotted Rainbow Trout was taken on a streamer and then released as we paddled. The first couple of fish inspired us. We paddled on through scattered cumulous showers and minor gusty squalls for more than a dozen miles as the sun set to the north. This was not an ordinary group of armchair adventurers. They pushed farther and harder with the LRRP objectives to go beyond where the guides had camped and boated before, breaking new ground. A simple pasta dinner fueled our bodies. The wind died after midnight and the mosquitoes were horrific. In the early hours of the second morning the group turned in to sleep. There was ice on the camp at sunrise on day 2 as the coffee boiled. Alaska’s skies had been “severe clear” last night, with temperatures below freezing. What more would the day bring? We broke camp and passed a fresh 200-acre lightning fire scar in the alpine tundra way up on a mountainside while thunderheads filled in the sky and the crags rang with thunder. Cold downdrafts followed by icy rain. The teams paddled on, hoods cinched tight. The vets hiked up a remote tributary while Lee and I stayed with the rafts. We fished a bit and waited for the younger participants to return. Lee and I are in our seventh decade and are OK letting the younger adventurers rack up higher mileage days as long as they returned to us later with fishing “beta”. Lee and I found ways to prop ourselves in the rafts and nap until their return. 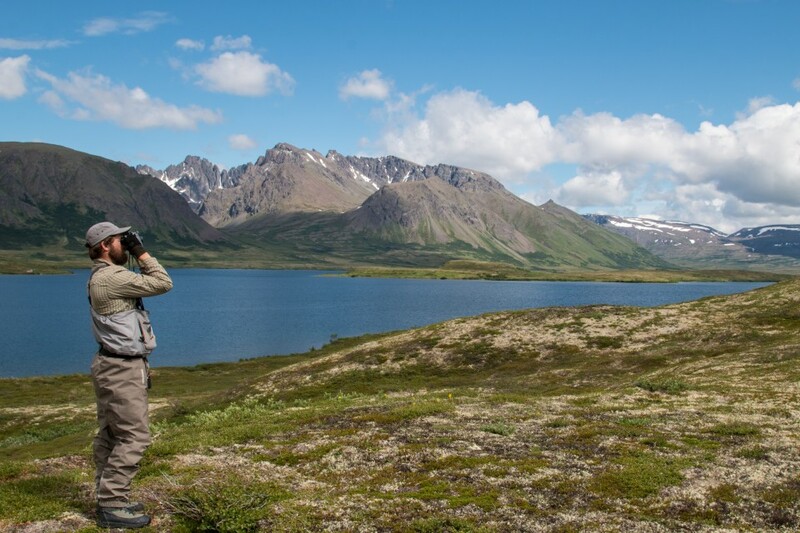 As we passed down river a bull Caribou was seen on a ridge on river left. 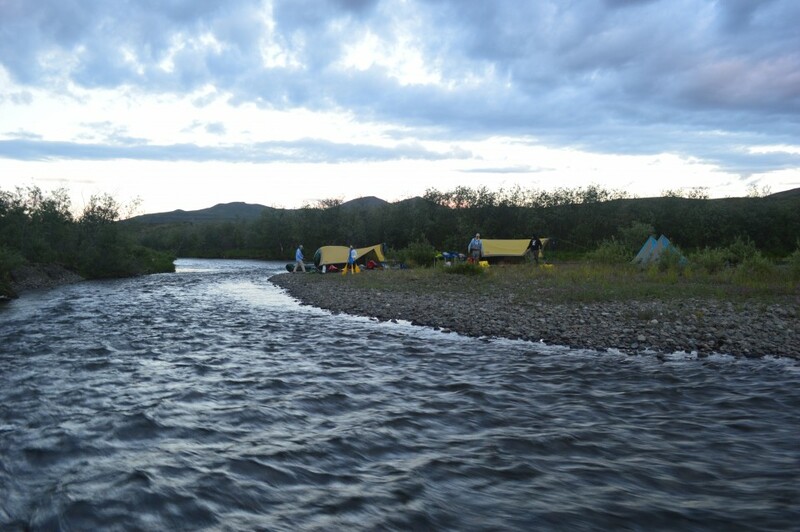 By days end we were more than 24 miles from the lake and found a gravel bar camp which had signs of hosting a moose hunter’s camp in a prior year. Biting black gnats were terrible when the wind died but we were fairly well protected by head-nets, buffs, and our shelters. For several days we explored side channels which hadn’t seen an angler in 8 months using a style of travel we called “jungle tours”. 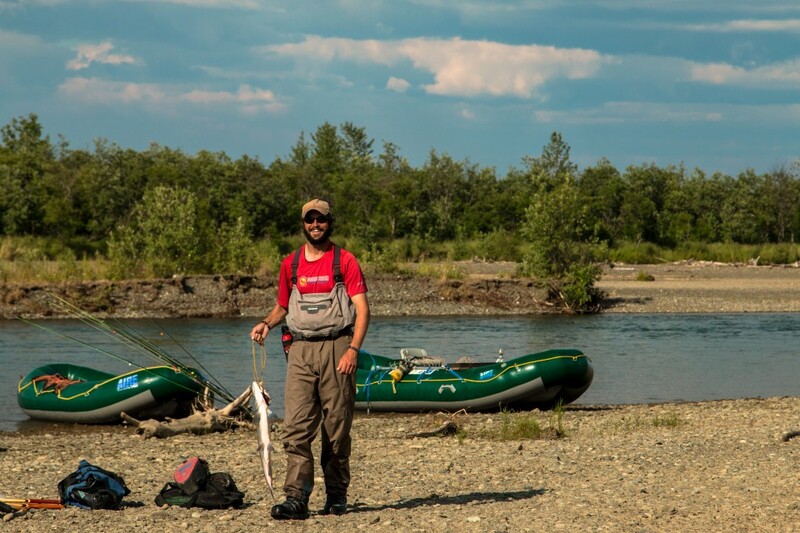 Unlike a typical guided raft trip where a guide navigates only specific river channels based upon the prior trip’s navigation and fishing success, with this team we wanted to learn channels not previously scouted. We’d send ahead a raft with scouts to ascertain whether a channel was navigable (prior to committing the full group). Because we were the first group of rafts on the river in 2015 there was in fact no way to know how the spring floods had rearranged the channels. Scouting was also particularly critical because our 2 paddle rafts required much more teamwork applying power strokes, managing speed, and effectively steering than our two oar boats. 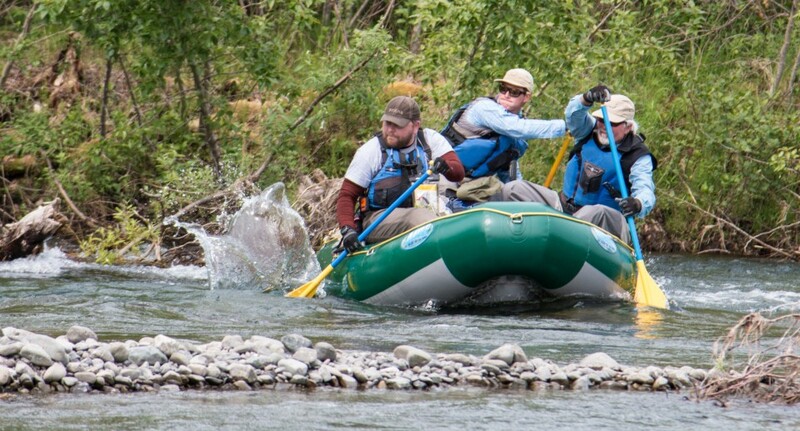 Vets in the paddle rafts experienced considerably more adrenaline per hour than those of us in the oar boats because of close encounters with sweepers. We descended into the portion of the Kanektok known as “the braids.” The Kanektok valley was blanketed with wildfire smoke and it began to drizzle. Jordan and Nick travelled with me and we exchanged stories to pass the time. 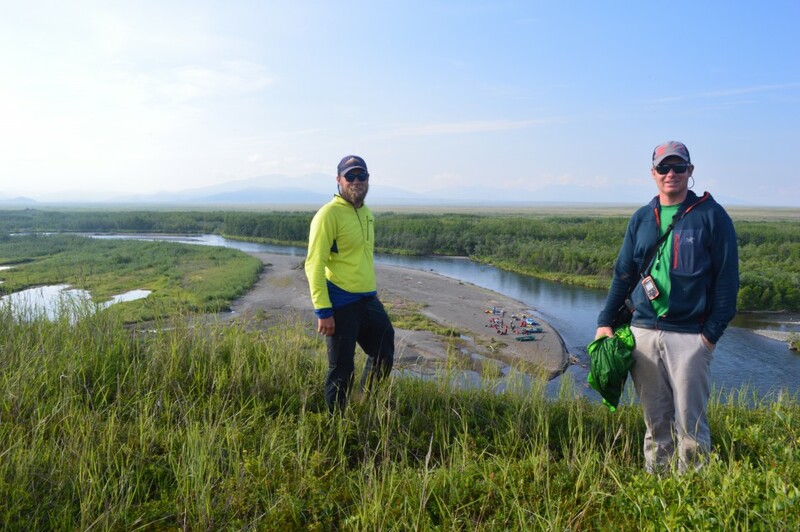 Jordan shared Alaskan adventures from his years at Fort Richardson and Nick, just off a successful summit attempt on Denali had his own Alaska adventures to recount. We passed slowly down the tundra valley measuring our progress against mountain landmarks. Our scout boat found the vanguard of the 2015 salmon run that afternoon. Small pods of Sockeye, and Chums, and a single pair of King salmon rested in a quiet pool. The salmon had come 60 miles upriver by this point while we had descended nearly 40. Camp 3 was below a dramatic bluff on a side channel we’d never stayed at before. Crews dragged the rafts up a side channel making camp in a zone none of us had ever experienced, keeping with our exploratory goals. Ravens silently came and went from a nest on the bluff. A huge solitary Brown bear’s tracks marked the sand bar and likewise tracks of a solo wolf. The bear that left those prints was one of the great old males whose tracks are only seen in the early season before people are on the river, then absent all summer, only returning very late in the autumn when man has left. Nick and I found scraps of fur and some vertebrae from a beaver, which had been recently consumed by either the Bear or Wolf. 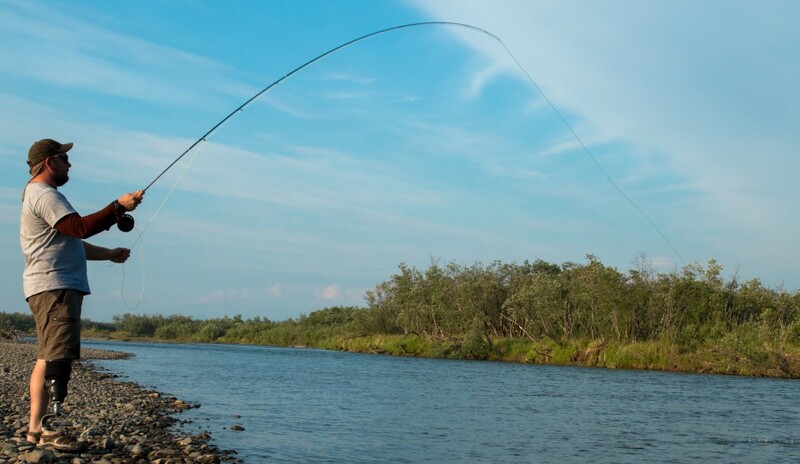 Fly rods engaged us with sport for hours as the landscape scrolled by and provided food for the table. The anglers searched with dry flies, streamers, egg patterns, and nymphs taking Rainbows and Arctic Grayling, which were released. 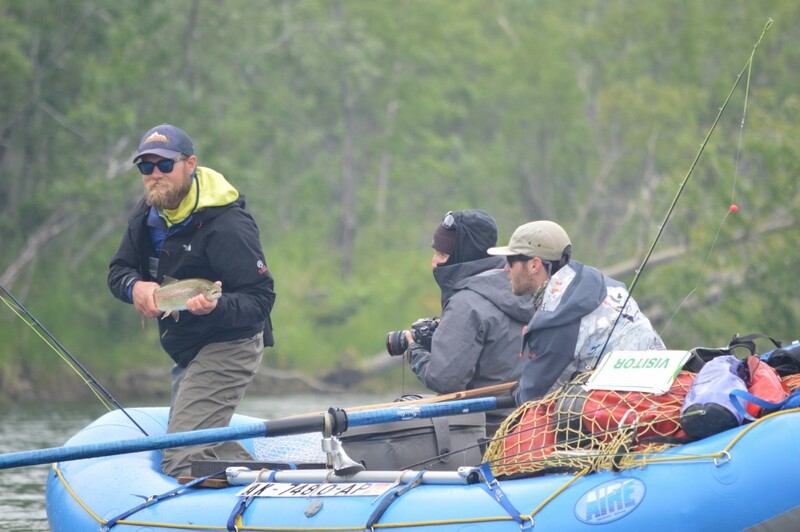 On day 3 Jordan Vaughn hooked, played, and ultimately lost a huge slab of a Rainbow, while the crew ate lunch and cheered him on. On day 4 Lee & Jordan lost track of the numbers of Rainbow they released, including some spectacular trophy fish. 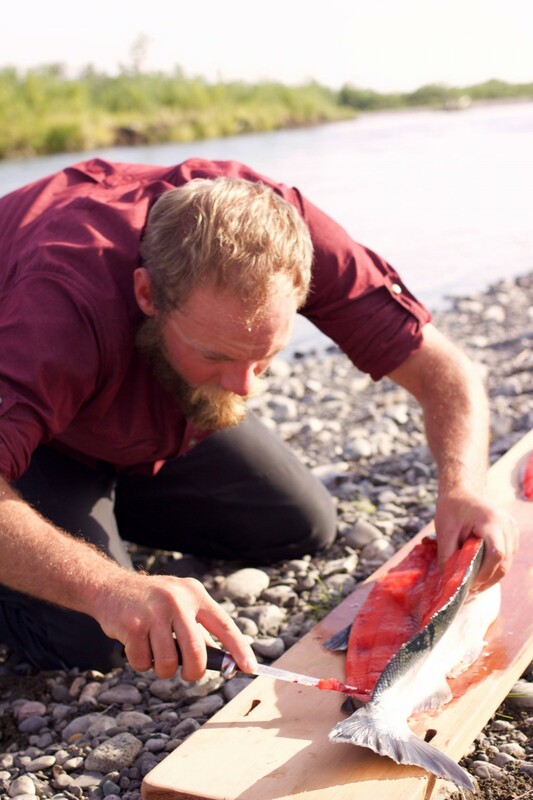 One day we killed a Dolly Varden Char for supper that had a 5-inch long fingerling trout protruding from it’s mouth. That night we had a simple dinner of Dolly Varden and rice. 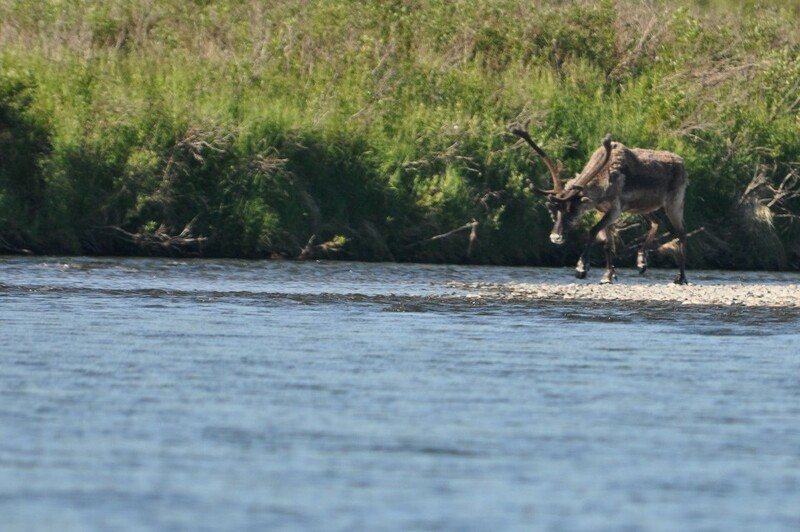 The animals we saw as we paddled downriver, in addition to Caribou, were mainly migratory birds. The brilliant Arctic Tern was a constant companion, scooping up salmon fry and delivering them into the blood red bill of their mate at the nest. The large sandpiper whose presence was so notable was the Greater Yellowlegs, which swooped about shrieking like a car alarm as we passed through their nesting territories. 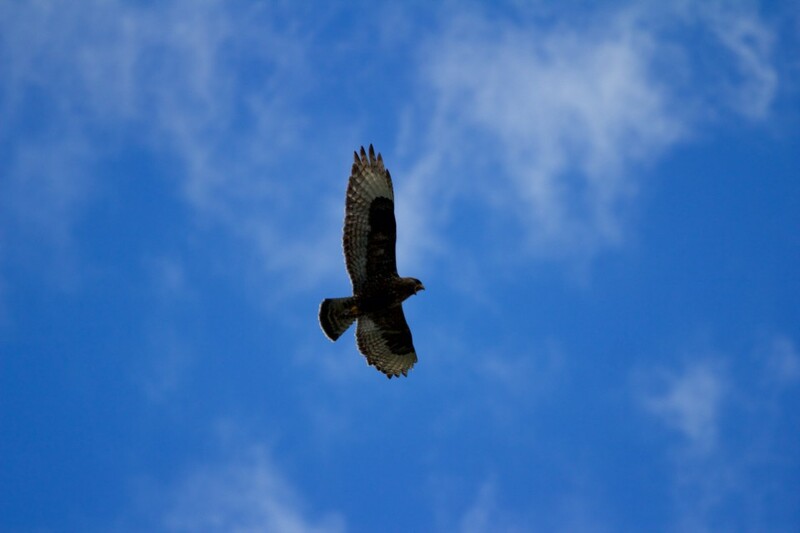 A territorial Harlans hawk screamed at us and Bald Eagles watched as we slipped past. A small colony of Cliff Swallow nests was discovered on an overhung rock bluff that looked like a human nose just above the river. We passed a family of Great Horned Owls. 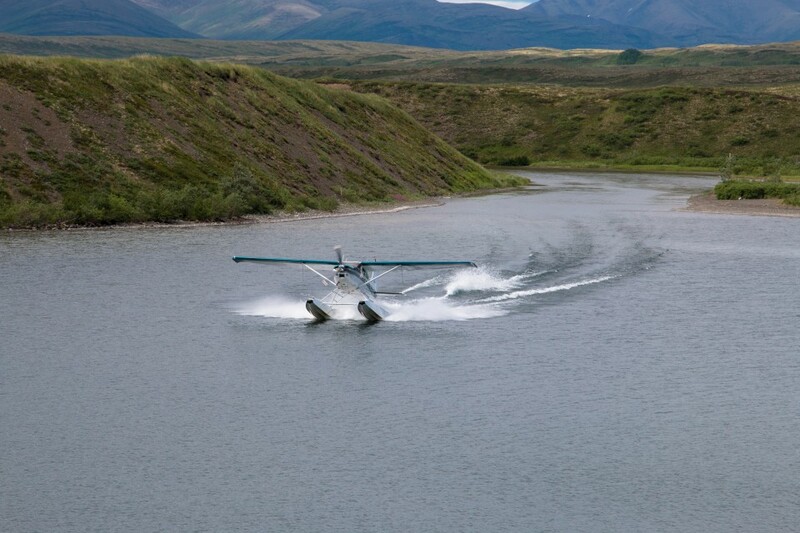 The birds and the smaller animals like Mink and Beaver were the bulk of wildlife seen on the river, while the “mega-fauna” like Caribou, were the memorable punctuation marks to the trip. From the log of. July 1, 2015. The log records “James is amazing with his prosthetic leg.” We travelled beyond the mountains onto the coastal plain. 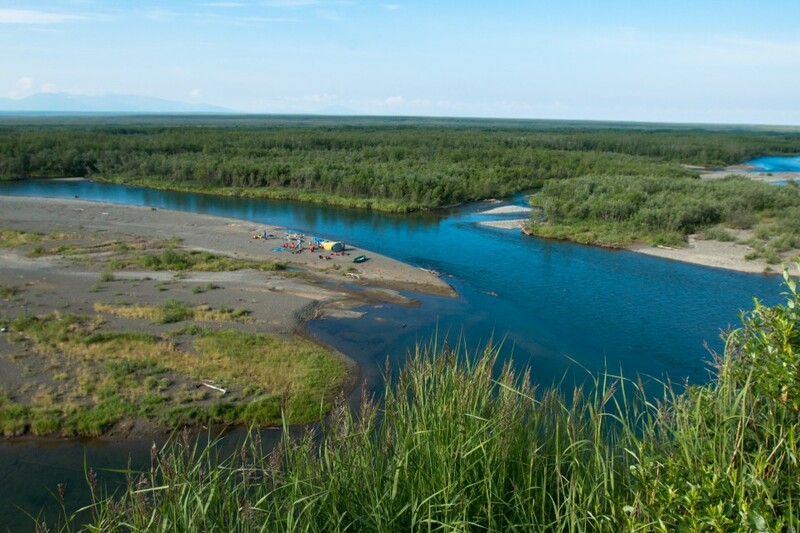 The high ground receded behind us and the river developed huge meandering loops, oxbows, and vast gravel bars littered with driftwood from prior floods. “The salmon pools are now longer and broader with emerald water”… and we explored new side channels but did not find many salmon or Char. “Today we saw the first set of human tracks, besides our own of the season”. We camped below a huge curving bluff that the Veterans ascended the following morning. As we spent days travelling together and night’s camping the team members shared stories of patrols rocked by IED explosive blasts and ambushes which left survivors with traumatic brain injuries, shrapnel wounds, followed by amputations, and rehabilitation. If ever there was a group of individuals grateful to be on an expedition across the vast Alaskan landscape this is the group. I can’t speak for the rest of the team but by day five I was fatigued by the long days of travel and the short, midnight sun drenched nights of sleep. Still we had more big days of travel ahead. From the log of July 2, 2015: “Jordan was on fire with lot’s of hookups and he took the first chrome bright Sea Run Dolly of the 2015 season.” We began seeing significant numbers of Sockeye as well as Dolly Varden. 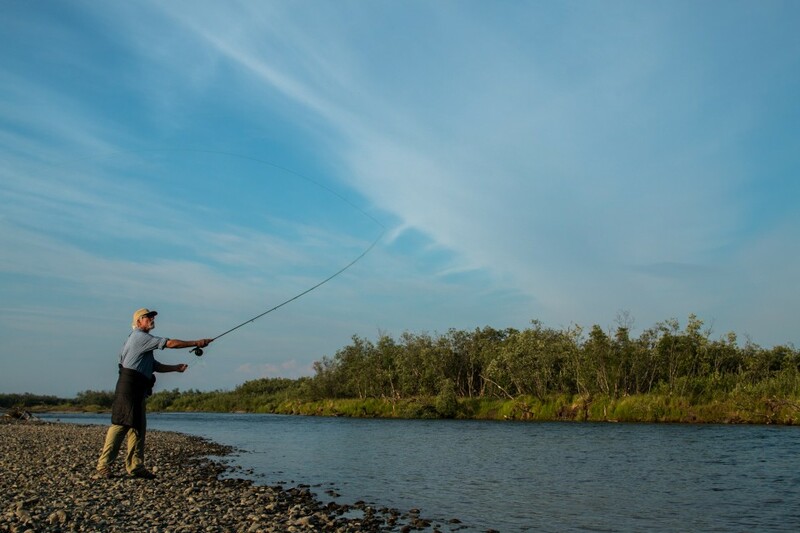 Now in the lower river the sport fishery grew more intense and the anglers put the fly-casting skills honed on prior days to work taking salmon and char as well as rainbows. Vietnam veteran Lee Hunnicut, the president of the Veterans Expeditions board took the oars on July 2’nd.” Lee is an extraordinarily accomplished man, a natural athlete and leader. 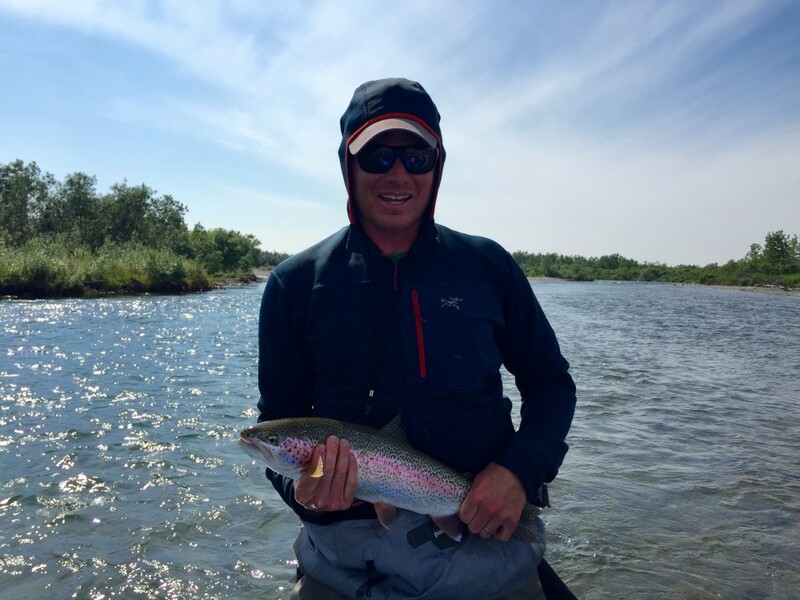 Lee rows class IV whitewater at home in Colorado and wanted practice rowing anglers with fly rods. On the oars we coached him just a bit, about the angle and distance to keep the boat from the target water and he took to it immediately. Brian and I fished as Lee rowed. 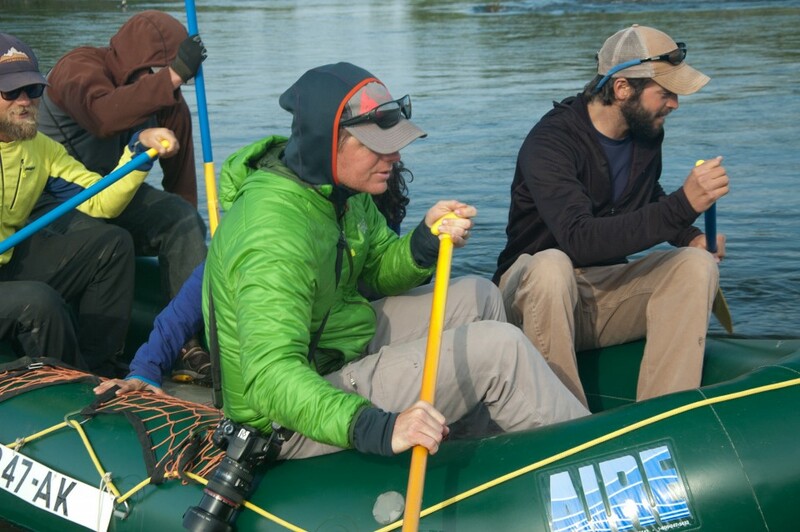 Unquestionably the use of paddle rafts was much more demanding on the team than traditional fly-fishing oar boats. There were some very tough moments avoiding entrapment in sweepers where only effective teamwork saved the day. The teamwork the Vets developed paddling and camping through “Jungle tour” section made the second half of the journey through the broad lower river seem straightforward. 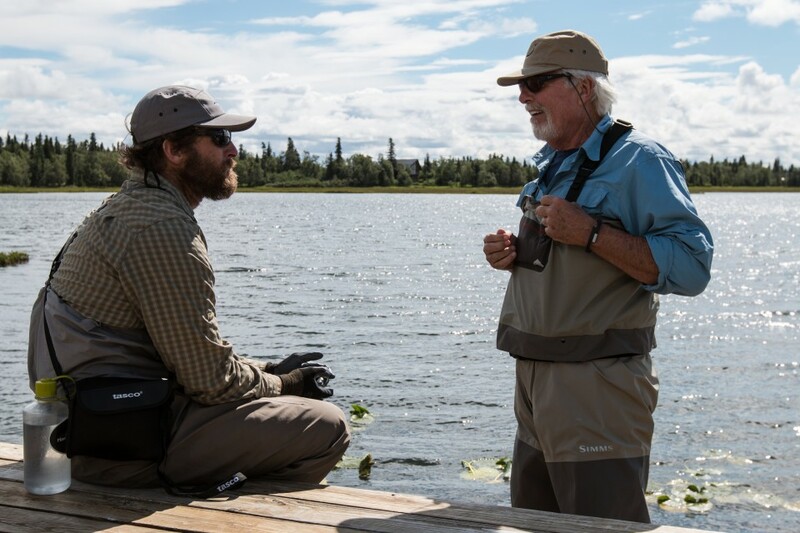 The boats were having increasing success with salmon, char, and trout and camp setup and breakdown was smooth. Steve Burns participated in every activity and did well. He reminisced after the trip that “I’m still recovering from a very serious traumatic brain injury and have issues with speech and balance” He remembers that one day he tripped over a tent guyline and hit the gravel quite hard. From all quarters of camp came teammates racing to help him recover and after the trip he reminded me “how selfless the group was”. 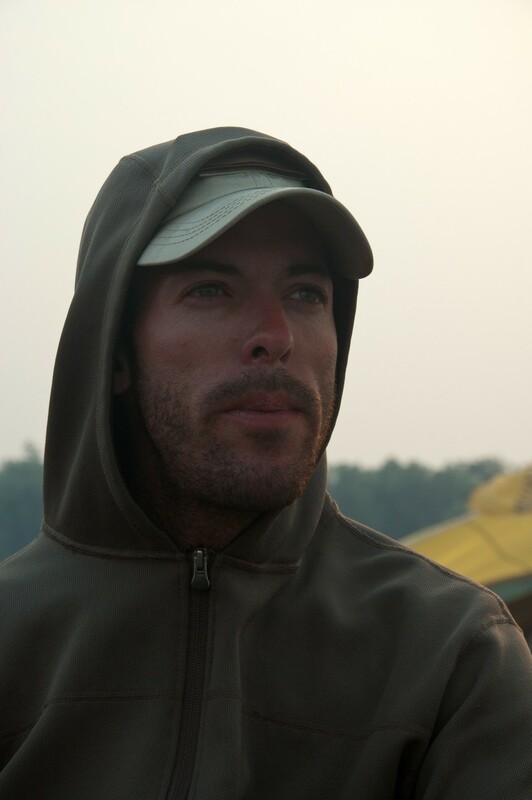 He said “I’ll always remember the amazing crew that accompanied me on the river”. On July 3’d after several days of fair skies and good travel conditions the weather turned hot and windy and smoke haze from Kuskokwim River wildfires dominated the atmosphere. We fished and rafted in the lower river listening to the songs of “dueling” male Golden-crowned Sparrows alternating from opposite banks. It’d been a week since we’d experienced any electronic media. Our audible world was birdcalls and the river sounds and our friends. We created our own fun with bantering camp chatter and humorous remarks punctuated with rock skipping competitions. That plus fly-casting was all we needed to pass the time. Our wildfire defensibility assessment concluded that we were bordered on 2 sides by the river on a sufficiently inflammable gravel bar, backed by a less flammable riparian corridor of green willows. We figured that we were likely in a safe zone. We watched the sky darken but the fire must have run out of fuel because it did not advance much further. We slept in the smoky gloom and later in the night a light rain washed the air clean. Like a military mission; dealing with gear bulk and weight is a large part of Alaskan expeditionary logistics. In the case of the Veterans Expeditions trip we had the initial constraint of fitting our gear & body weight into high performance, bush capable, aircraft with finite capacity and then later of moving the gear across the landscape by paddle power. 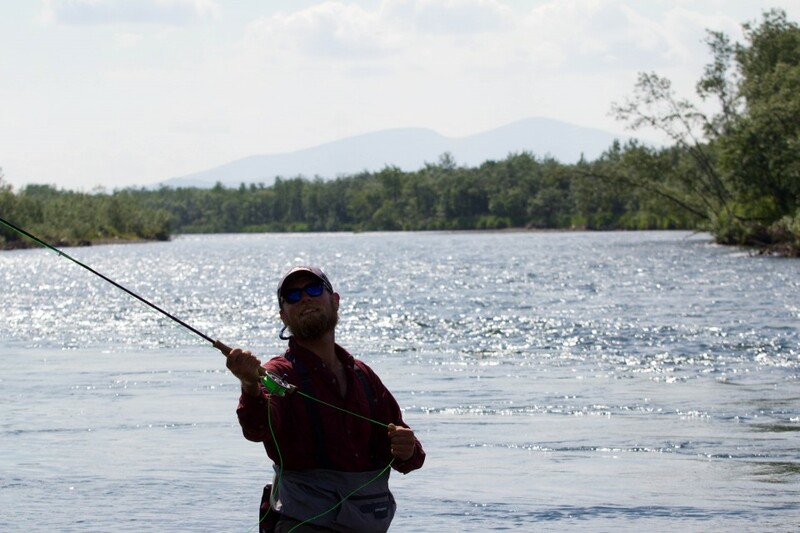 Our team members had various abilities from athletic alpinists to significantly disabled anglers. One team member was a leg amputee who surprised everyone with his abilities wading, dragging rafts, and packing gear across uneven terrain. Mornings he’d hop into camp one legged then attach his carbon fiber leg and grab a coffee. We had a team member with a TBI (Traumatic Brain Injury) of epic proportions who paddled well, developed a serviceable cast, and packed dry bags across the gravel bars with the rest of us. Weight limits and paddle raft performance? We knew the paddle rafts must be as light as possible. Food & clothing would be cut back to save weight. We didn’t carry coolers nor any ice, saving dozens of pounds. Bacon and eggs and perishables? No. We packed light dry foods like pasta and rice with high calories that could be supplemented with fish. From the earliest stages of planning we considered what our shelter options were with respect to travelling light. To sleep in tents or not? 8 of us slept in Black Diamond Bivy sacks clustered under communal MSR Outfitter Wing shelters saving 75 pounds of tentage. The fishing during the first week of the Kanektok season was never “stupid”, nor easy, and while we released the majority of the fish hooked, the group worked hard to kill an occasional salmon or a brace of Char feed the crew. Each of us took note when a “supper fish” was killed for dinner. A fish for supper meant something different than it would if a cooler of steaks had been brought along. 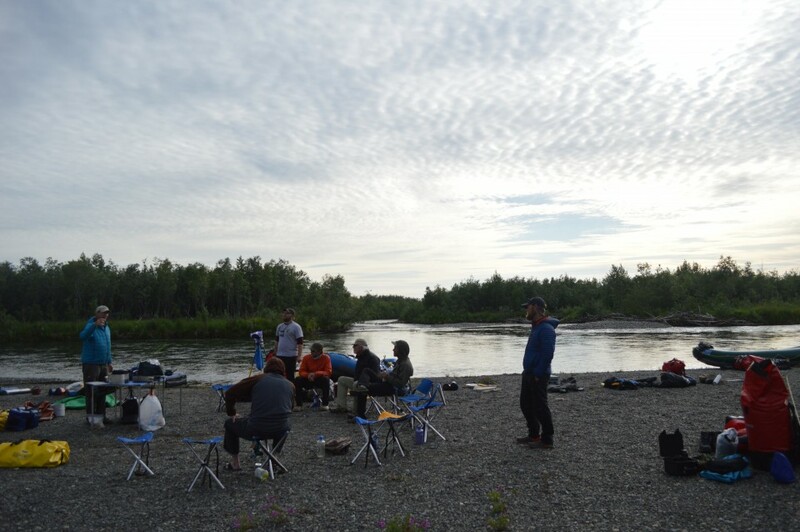 The fishing changed dramatically for the better on July 4, with V wakes from incoming pods of Char & Sockeye pushing across riffles and holding in eddies. 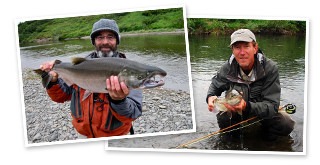 Now the fly-fishing turned on providing opportunities, challenges, and spectacular fresh fish for dinner. The Dolly Varden were eager to feed on salmon eggs and took trout beads without hesitation. We experienced the strength of Char who’d just returned to fresh water after months eating a rich diet in the saltwater. 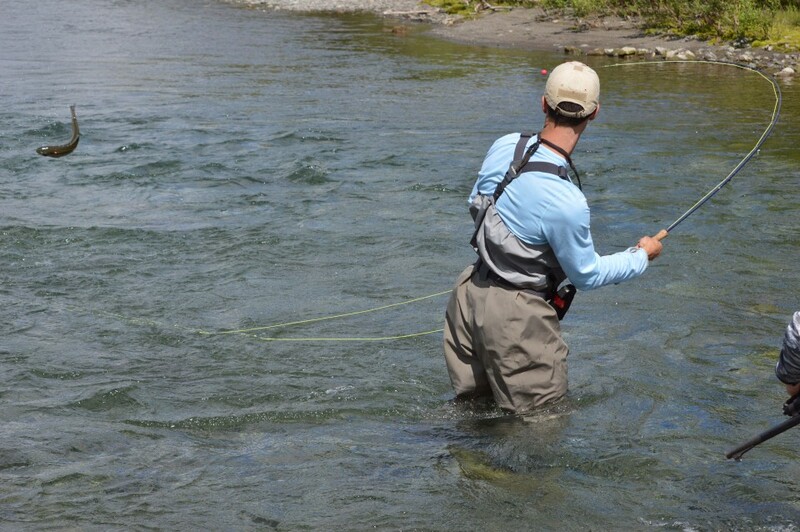 They charged about the riffles like Steelhead and porpoised across the flats when hooked. 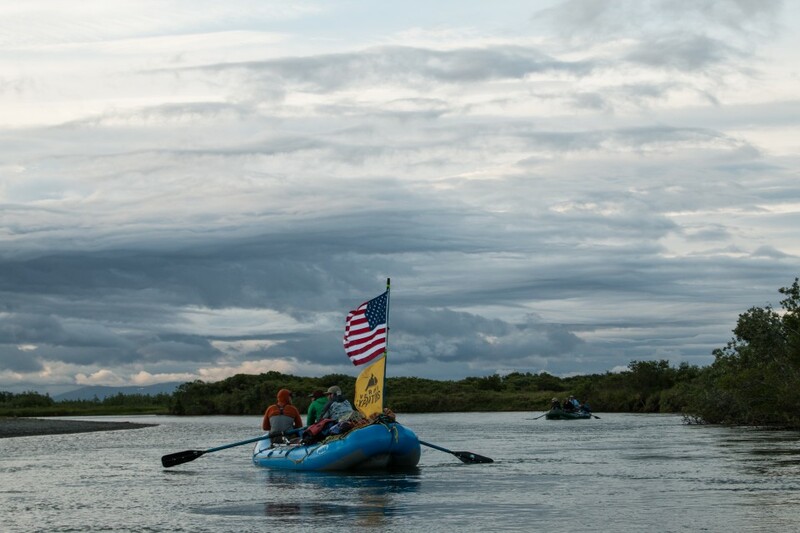 On Independence Day, we paddled to our final camp flying the stars & stripes above an oar boat. Each of us was acutely aware that fortune allowed these particular men to survive where others had fallen. As we passed down the final miles of the Kanektok, flag raised, powerboats from the fishing lodges pulled aside and cut their motors to let the Veterans pass. It was completely unscripted and a fitting end to a great adventure.